The Israel Media Series is an ongoing media series that began in 2010. 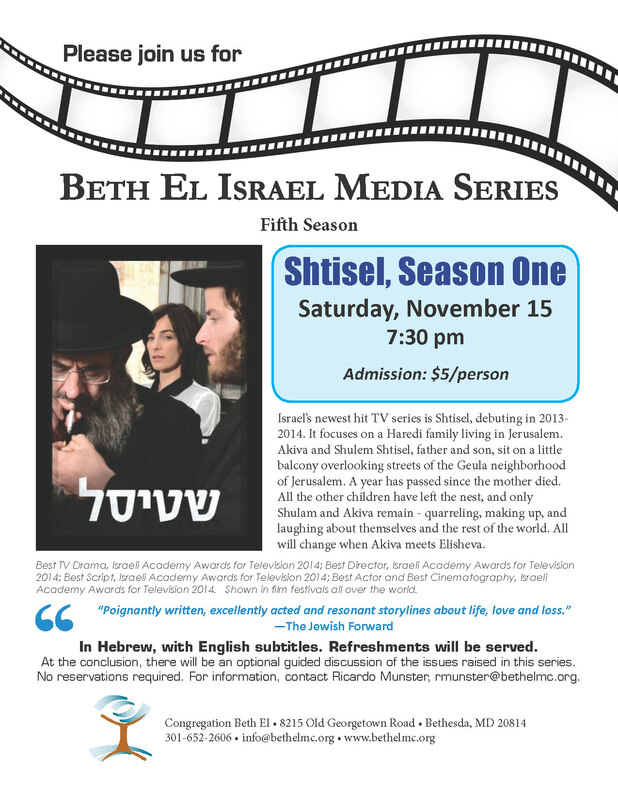 Screenings are almost always the third Saturday evening of the month, after Shabbat, from October through May. Rabbi Rudolph’s idea for the series stemmed from his desire for Israel’s story to not only be told through what is seen on the front page of The Washington Post but, with the help of film and television, to also present Israel’s rich, cultural creativity. A number of congregants assisted in launching the series and choosing the films and TV programs, including Jonathan Band, Leesa Fields, and Bob Litman. Carl Leventhal and Jonathan Levy have also joined the group. An optional post-screening discussion is held for those who would like to participate in a dialogue about the evening’s program. Refreshments are included in the $5 charge – making this one of the cheapest date nights on Earth. Attendance averages about 50 per screening and is steadily increasing. Contact Ricardo Munster for more information at rmusnter@bethelmc.org.